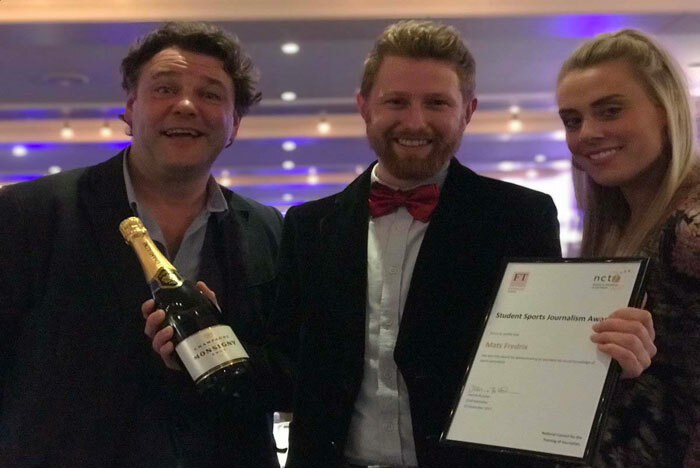 An alumnus of St Mary’s University, Twickenham won a national journalism award at last week’s National Council for the Training of Journalists (NCTJ) Awards. Mats Fredrix picked up the Student Sports Journalist of the Year Award at the ceremony at Hampton Court Palace. Mats, born and raised in Belgium, studied MA Sports Journalism at St Mary’s and graduated earlier this year. During his studies at St Mary’s Mats worked on Sports Gazette, the University’s student-run and student-led website for sports news, views and exclusives. He is currently working as a video sports reporter for Perform Media Group and is keen on cycling, football and tennis. Mats said of winning the award, “It really came as a surprise, but all together it is great confirmation that I made the right choice moving to the UK and wanting to become a sports journalist here. My whole family has hugely supported me in getting here and I owe them a lot. Programme Director for Communications at St Mary’s Daragh Minogue, said, “I am absolutely thrilled for Mats, he is a talented, hard-working sports journalist, who I always thought was destined to do big things. “During the course last year, I remember all the other students giving his films a great round applause after each screening. The judges commended him for his creative storytelling, something we try to instil in all our students on the MA in Sports Journalism”.